There is the undeniable fact that black people, even black youth, are treated systematically different in this country. We can no longer afford for this truth to be ignored. The cost of this continued ignorance comes at the cost of more black lives. This is a truth that is unacceptable in any society that wants to claim to be post-anything. With reporter Gary Webb back in the spotlight, the thing that is missing from these headlines is what the black community has always known – that the CIA was flooding black communities with crack cocaine. This served to benefit the US in two ways: it 1. allowed for the US to fund the Nicaraguan Contras without directly linking themselves, and 2. ), in relation to this article, they were able to interrupt the black liberation movement of the 60s-70s by criminalizing the black community, disrupting black advancement and stealing black wealth. Reaganomics and these racist policies was a great tactic that continues to support white supremacy and capitalism over black Americans. In 2007 we saw the largest theft of black wealth. Which only increased the systematic discrepancies between the loss of white homes and those who were black. It has been revealed that banks such as Wells Fargo purposely targeted black homeowners for their sub-prime loans. Was this on accident, or instead a calculated plot by financial institutions with the complicity of the US government to make sure that White Supremacy remains untouched? Both the US government and its institutions were built on white supremacy and anti-blackness. They have been colluding since the inception of this country to ensure that their empire remains intact. With an unending threat on black lives – and the Christian State of White Supremacy still at large (read here for more on CSWS) – liberalism should be seen as much of a threat to black liberation as the white supremacist American justice system. The dominant narrative of historical black resistance has been to use liberal tactics such as advocating for change through voting, reform and civil disobedience. These tactics are not only ineffectual but, given the complexity and structural corruption inherent in our system, are also intentionally complicit in our oppression. Liberalism is used to pacify any attempts at disrupting and changing the system, because in fact liberalism benefits from that said system. If you look at the events in Ferguson, the power structure made many attempts to co-opt energy that was inspired by the killing of Mike Brown and many other killings of black people by the hands of the law. With the immediate condemning of the few acts of property destruction that took place, the “rioters” were then met by outside pacifiers, looking to quickly rebrand and attempt to gain control on the black youth lead revolt. You could see that as recent as Ferguson October ideological clashes occurred between the youth and the self appointed black leadership. The ones who are so necessary for white liberals, who are eagerly trying to figure out how to control black rage, or at least help redirect its anger to something more positive and less threatening to their way of life. On Twitter you could see the split between the weekend protesters and those who had consistently been on the ground. Here in Los Angeles, soon after the first spark of Ferguson hit the ground, Ezell Ford a 24-year-old black male was murdered by LAPD. A week later white liberal activists had quickly organized an event. 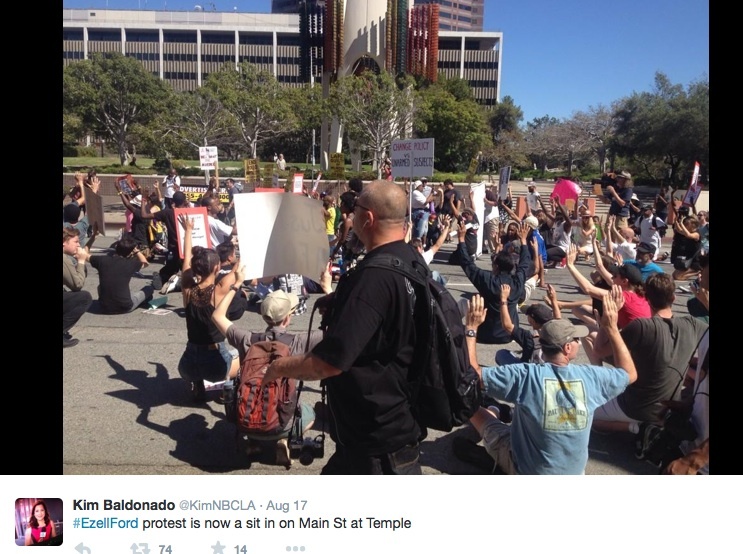 The first event took place in front of the LA police headquarters and was full of erasure of black struggle, with white people chanting, “we are all Mike Brown” and “hands up, don’t shoot”. The state has many tactics – liberalism and co-optation are some of them. Hierarchical revolutionaries are another. It is important that black resistance be fought in a horizontal way. The idea of leadership and false prophets should be deconstructed, and collectively shunned from uprisings. Whether that may be the head of the NAACP, the New Panthers, or some white liberal activist organization that claim they want to help fight in black struggle. Liberalism and those who serve to protect it only work in management positions. They cannot be seen as allies, but as compromised people who have a vested interest in maintaining that same structure that is used to terrorize, dehumanize, and execute us with impunity. This is done so with every liberal chant for peace and chants for non-violence. 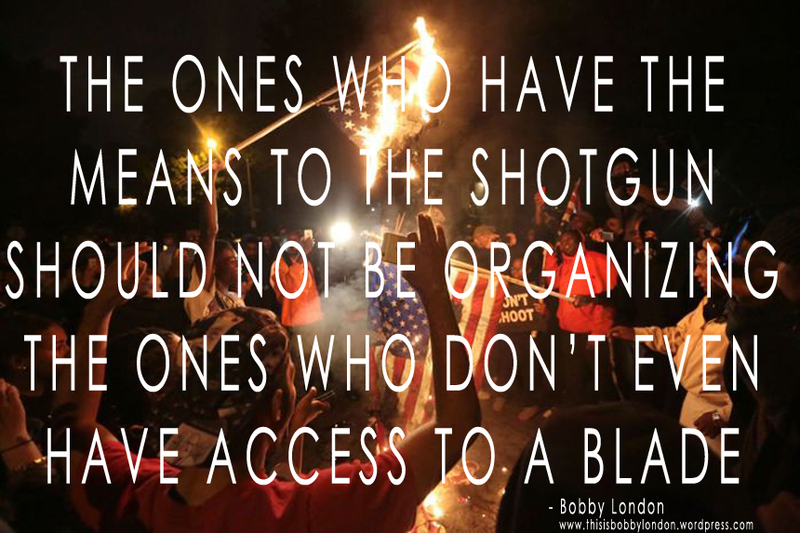 The ones who have the means to the shotgun should not be organizing the ones who don’t even have access to a blade. If you enjoyed this writing and other pieces by Bobby London, please consider being a patron and contributing to a monthly or one time donation here. Christ is alert and aware of all the non-activity of those pulpit warmers who refuse to speak out on the demonic influences that have been allowed to prosper in and dominate police forces , government , political arenas, financial structures and every other area of life where black and white faces meet! This is a demonic problem that only a Christ/God/Holy Spirit -like response can solve! Yet, there is not one mega-church response that is reconciling and recognizing that through love, peace, forgiveness and Grace , God will Himself repair and then restore all that satan has destroyed and stolen! God uses people to work through because seeing His face, none could withstand His Brilliance! Yet again, the mega church’s pulpit warmers won’t even present themselves as vessels! Corinthians states that if one member fails , all members fail! This whole scenario is no surprise to God it is a harbinger of The Manifestation of His Glory! Also, look at all the white faces assisting and protesting along with black faces ; and then, look at all the black faces running for cover, hiding behind white supremacy! Now you tell me if this is really not about God, The Supreme Being , against satan, the defeated devil ? Get God to lock arms with the front line men and women and then all the weaponry in the world would not matter!!! The name is Jackson ;maybe, Jacksin is a psychological slip because what is going on around the world as a black face , is a sin not a son! So, Williamsin; Robinsin; Johnsin; Robertsin; Wilsin; Thompsin; and into black infinity!!! Since God calls us sons and daughters , no one can call us otherwise! Because Christ took sin upon Himself, became sin and died as sin so that we can become sons and daughters, who is it that dares to call us sin/sinners? This battle is not ours , because the weapons of our warfare are not carnal because our Commander-in-Chief is God Almighty! Just you all watch and wait, He has shown up just as surely as this and every other battle is already won! Paradoxically, fellowship with other believers develops most deeply in persecution! Mega church leaders: your presence can be felt and appreciated through your supply of refreshment centers for the protestors , offering all types of waters , breads and condiments( jams, jellies, butters, cream cheeses ) and The Word of God (printed bibles and taped Bibles with the accoutrements to listen to tapes)! After Jesus raised the dead, casted out demons and healed the sick/diseased, He required them to eat! We, black people, have now been raised from the dead, demon-free, delivered and healed because of Ferguson! Pastors, physically and spiritually feed those at ground zero because Jesus says for you to do so! God punishes sin because He is Just! God sent His Only BegottenSon, Jesus Christ so that He would become sin and so that He would suffer on The Cross in our place so that we would not have punishment! God did it this way because He is our Father and He loves us sooo much!! Who are these people and what institutions are these that they can now try to undo what God did? Wait, Watch and Pray because God will never , ever be mocked! Not only does God have “Fergusons” in His Hands, He has the entire world there as well! Look at what is going on in the world that mirrors what is happening in “Fergusons” and by whom it is happening ! God, not chance, is in control! It’s not get and be on the right side of ‘his-story,’ it’s get and be on God’s side! Thank you for emailing Hillsong NYC. We appreciate your desire to serve. At this time, Hillsong does not have a ministry delegation in Ferguson, and the people we entrust with the Hillsong NYC platform are solely people from within our own church or who have a close personal relationship with the Hillsong global team. Thank you again for your interest, but at this time we are not able to support your ministry financially or send you on missions on our behalf. We do pray for you to find a way to do the things in your heart for God’s kingdom. We are believing for God to do incredible things through you. It is historic that black on cop crime is nonexistent but black on black crime isn’t ; however, it is also extremely , egregiously disingenuous for cops to use this as an excuse to kill black on sight! Black on black crime is ceasing and once it does completely cease, what will cops use to explain the fear underlying their reasoning for killing black on sight ??! God knows and only He will restore , repair and reprimand! satan wants us to look at the lgbt community and compare their rights and freedoms to those of black people so that we can join the lgbt community and be free ! Don’t fall for his deception and tricks , follow Jesus and be really free even if imprisoned because God is with us as He was with Joseph in the pit and the prison and even in Potipher’s house! Emanuel, God with us, will never leave or forsake us! When you are God’s beloved child, there is no such thing as a coincidence! Over the weekend, two young black male children were murdered by police, both of whom were unarmed ! But for these unfortunate deaths , the grand jury would have come back with a non-indictment decision ! Yet , with the blood shedding of these two angels screaming out as Jesus did in the Garden of Gethsemane saying, “Enough” ,this is certainly the harbinger that Darren Wilson will be indicted and that the Killology of Police has been put down! Let there be no mistake , Darren Wilson and Police Killology have been indicted! God is Truth and He allowed these occurrences to unfold as they have because nothing shall be hidden that is done darkly in the dark!!! Thank You Jesus for making clearer what some just may have thought nightmarish ! Without a doubt ,because of God’s Clarity , we all now know that everything we ever thought about the police but were too afraid to believe is believable and true! Please, pray for the people who kill or would kill to maintain white privilege because obviously they didn’t listen when Jesus said that the first will be last and the last first and that the ending is better than the beginning ! You know, He also said that those who forsake all for Him will enjoy just that much more in this world and eternal life in the world to come! Humility is the color of one’s skin and we all know that God exalts the humble to where no one can abase ! created things! Not only is it criminal what white supremacy is trying to do, it’s unnatural , anti Christ! When God speaks and loves and forgives and does anything, it’s done by deed not by word or tongue! White supremacy , correction is happening now, open your eyes and hearts so that you can be restored unto God and your days of old ! Mega preachers of mega churches , please, give unto the lost lions of God’s Loins! Jesus has often been referred to as The Lion of Judah and since we are made in His Image and Likeness, we too are lions ! Even though all of our black boys and men are lions from God’s Loins, many of them are lost! Give them The Way, The Truth and The Life Who is Jesus Christ and in giving them Him, don’t forget to feed them, clothe them, shelter them , visit them in the prison or hospital and then give them a job because Jesus has made this rescue mission yours when He anointed you for His Call! Don’t be upbraided for your unbelief and hardness of heart because to whom much is given, much is required! Give these Lost Lions of God’s Loins Jesus Christ Who is The Way, The Truth and The Life because this much God has given to you ! Reading some of the young civil rights’ leaders tweets you get the impression that seeking , pursuing God/Jesus for answers and resolutions is a stall tactic a mollifying device! Then, when anonymous says we are legion and we don’t forget or forgive , alarms are sounded! God knew what would bring attention to police executions of black males so He did it His way; no indictment ! If there were indictments , then this would all be swept under the carpet until the next one….. satan is using this stage to draw many away from God so that satan gets all the attention through his evil, wicked ways!! Protesters , don’t fall into the deceiver’s trap , trust God to do what only He can , defeat/destroy evil and judge by correction! Okay mega church leaders, you are right , forgive me!! You should be preaching and teaching to the law enforcement community , not to the black community! The law enforcement community is sinful and demon possessed to believe that God doesn’t know how The Truth should be freedom for everyone; however, the law enforcement community is fundamentally founded on lies when they have a history of working hand-in-glove with some of the worse criminals imaginable ! They therefore feel that by demonizing, vilifying and criminalizing one segment of society, the black american , then their agenda of covering up for the real criminal is accomplished! Politicians and Wall Street and the “elite” , they are the real criminals , enriching themselves off of the black bodies ‘ body bags!!! When reading about the ease with which some black males gun down each other, then yeah, police just don’t want that to happen to them! They don’t fear so much as they want to stay safe! Yet , you have these racist cops who are waaaay out of line when it’s apparent that their safety is not in jeopardy ! On both sides, there are the good who suffer for the bad, careful police and innocent , non threatening black males! How we identify the good from the bad is what needs to be done so that senseless deaths and senseless hate can cease! God is the answer and I have been made privy to the curriculum that He wants developed and implemented so that His world becomes a much better place! I will lay all out for you in the future so that we all do get along! Love God so that then you will love yourself as you love your neighbor and remember the parable of The Good Samaritan so that you will then know who is your neighbor! There now, the egress from all this mess!!! Every time I hear John Crawford’s name, I cry ! His smile, his face , his thinking , all so promising and hopeful! He is now one of God’s angels who is right now galvanizing millions for God’s sake and for peace’s sake! So too with Tamir’s playful behavior , right before his murder as with John, so unassumimgly joyful and hopeful as if they both knew that within minutes, seconds , they would fulfill God’s Purpose, finish God’s Work and establish God’s Covenant! They knew what was imminent so let us not let their lives be wasted , MOVE!!!! I can’t even watch a television program where s’mores are involved nor will I ever eat one because John Crawford was gunned down and murdered by racist police who wouldn’t even allow him the privilege of tasting that dessert ! Thank you to all the cops in the world who love to hate and kill young, black males, less fattening good for me! May God have mercy on your souls and may He expedite the forgiveness in my heart for you because you all are missing out on the enjoyment of Truth, Light and Love! Know God and then you will know Truth, Light and Love!! Do I cry for JC because of the reminder of how poorly Jesus Christ was and is treated? You would be surprised of the similarities between Jesus and John’s temptations( hardships and rejection) and the similarity between Jesus and The Black Race , period…..
Jewish people of the Old Testament, no one saw God’s Face! Black people of the New Testament, we know what Jesus looked like! Black people, then, of the Old Testament , too? Jesus is God is The Holy Spirit, Triunal God!!! As I have been saying since day one, “God does not punish because He is a just judge , He corrects us for our own good!” What North Korea has done to Sony and to the world is exactly what the racist world has been doing to Blacks for forever, taking away the rights and liberties and freedoms protected under God! Don’t hurt or harm or kill God’s beloved children because the correction won’t be pleasant, it stings like a locust! Somebody please help this guy, I am praying for him! The trend was set back in the 80’s , get black mayors and black police chiefs and black government hierarchy then the communities want be malcontent when the legalized murders and brutality and thefts of blacks exceed those of there white counterparts and nothing is done about it!! It works and is still working but better because now there is a black president ! Why do we still believe that satan comes as a horn wearing, spike carrying blood red beast when in effect he comes as everything that we dream and desire?! Black officials should stop worshipping their positions and bow down only to Almighty God!! Baltimore is an example ,as well as the United States , of this demonic phenomena ! Get God not Black!!! At Last! Thank God Almighty , At Last we are getting close to what You have prepared for ALL of us! God’s Judgement is Justice! SA Mosby, you are one of God’s emissaries !! !